Thompson and Planning District Development Plan (DP): The updated Development Plan establishes a clear framework for land use decision-making within the Planning District. It aligns with Thompson’s Sustainable Community Plan and Master Parks Plan. The DP identifies six Policy Areas with distinct characteristics and specific development policies. The updated DP provides certainty to public and private investors with respect to the future development of land. 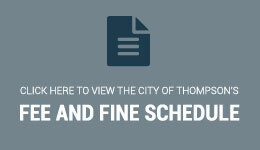 City of Thompson Zoning By-law (ZBL): The Zoning By-law is a companion document to the Development Plan. The ZBL ensures decisions made by City administration, Council and the public reflect and are in compliance with the objectives and overall vision of the Development Plan. The ZBL’s new user-friendly format and alignment with the updated DP ensures a more open, accessible and efficient development approval process. City of Thompson Sustainable Asset Management Framework (SAM): The SAM is a guiding document, providing Council with the tools to set a long-term mandate for the City’s Department of Assets and Infrastructure. The SAM recommends next steps for the development of an Asset Management Plan for all types of municipal infrastructure. It identifies the critical relationship between infrastructure spending, land development and economic development. The SAM will be partially implemented through a new dedicated infrastructure funding arrangement between the City of Thompson and Vale.